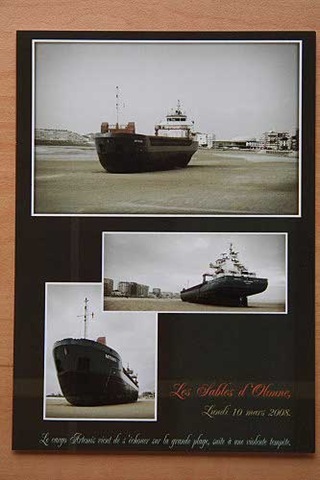 While we were investigating La Tranche-sur-Mer yesterday, Carol found a post card depicting a large cargo vessel parked on the beach at Les Sables d’Olonne, embarrassingly close to the promenade. It had apparently been driven ashore during a bad storm, we thought in early May. 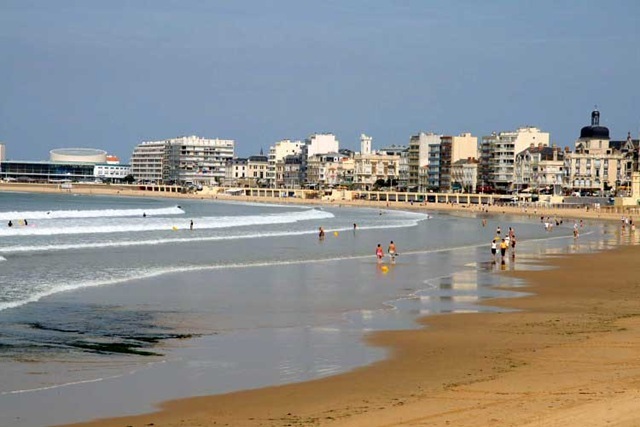 Largely in the hope that it would still be stranded, but also because we wanted to see Les Sables anyway, we loaded the bikes onto the car so that we could park outside the town and cycle in, and set off. Managing with difficulty to avoid car parks with height restriction barriers that would have creamed our bikes, we got parked, picked up the cycle track and pedalled into Les Sables. Serious disappointment – no stranded large cargo vessel. What you-know-who had read as "May" had, in fact, been "March" and the recovery operation had been completed. Mon Dieu! We can’t have a large cargo vessel taking up valuable sun-worshipping beach space now, can we? Undaunted, we poodled around Les Sables looking at the various remaining sites, none of which were as interesting as a beached large cargo vessel. Then it was back to the car, bikes back on the roof, and off to search for the Les Sables McDonalds. Not only did we find it, complete with McWiFi, but, since it was getting well into lunch time, I broke the habit of a lifetime and bought McDonalds version of food, a "Chicken Mythic" with Yankee McSauce, as well as the usual two espressos and ice cream (sundae de la saison) for you-know-who. I won’t bother again; the "Chicken Mythic" was predictably McTasteless. I won’t try again. My late afternoon/early evening was spent on a jay hunt. 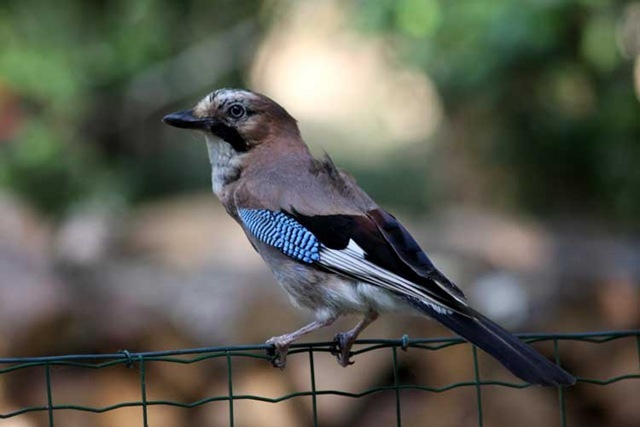 We had a local jay which seemed to be doing a relatively predictable round of the campsite. Part of its routine was to look for insects on a wood pile and fence opposite our pitch. I bolted on the long lens and tried to wait patiently. (Patiently, for me, means not fidgeting more than once per minute. This is why I could never be a fisherman.) My version of patience paid off in the end and the jay, relatively undaunted by my approach, posed for a photo shoot. The jay wasn’t a pristine example, having a few ruffled feathers, but the resulting bird filling the viewfinder constituted something of a victory. I believe this is the second time I am aware of that you have eaten at McDonalds. Let us not forget the time at the National Avation Museum in Northern Virginia. Darn, you’re right. I claim mitigating circumstances, namely a lack of choice, on that occasion.